Tell me and I forget, Teach me and I remember, Involve me and I learn _Benjamin Franklin. This is the philosophy we profess in the Pre-primary wing of our school. 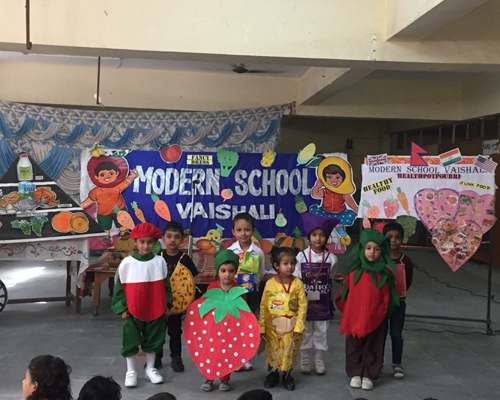 The pre-nursery / Play way section of Modern school_ MUSKAN caters to the needs of 2+years old. It is a brightly painted, lively and colourful arena within school premises where the little ones learn and explore in their own special and varied ways. 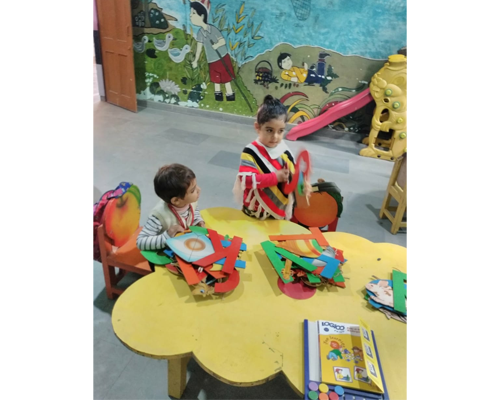 Equipped with numerous toys, blocks, puzzles, learning tools and play material, children get ample opportunities to stimulate their senses and foster growth and development. We know that learning can happen when it is least expected-while quietly with blocks or may be just by listening and imitating the teacher, while lazily doodling or while taking a walk in the park. In Muskan ample exposure is given to the little ones to tickle their interest , make them outspoken and confident, active and groomed while all the time making them enjoy. Interactive learning through smart boards and oral activities with the mentor make learning fun-filled and enjoyable. Birthday and festival celebrations, regular picnics and educational trips sensitize the little ones about the rich Indian culture and values and also strengthens the bonding between their mentors and friends. And the presence of loving ,friendly guide and mentor to facilitate all these makes these classes fun-filled learning haven for our kids------ a home away from home indeed.